This Astra H VXR has been with us before for mapping and has a K06 turbo, full 3″ exhaust, Courtenay Klasen inlet manifold, CSRacing intercooler, steel rods (plus all the other required components) and achieved a very respectable 329bhp and 350 lb ft torque when last seen in the July heat this year. Previously running a standard actuator, the car came back to us for checking and additional mapping after a Courtenay Turbosmart uprated actuator and recirculation valve had been fitted. We were able to have some further changes made to the boost, fuelling and ignition timing after the replacement actuator had been fitted, but the biggest change was the colder November temperature, meaning the dyno cell was lovely and chilled. Final mapping saw a recorded power figure of 349bhp and 370 lb ft torque with more boost through the mid range helped by the stronger actuator. It goes without saying that the car was running Shell V Power 99RON fuel. We still quote expected gains for this conversion at 330-335bhp, becuase we see and map more cars during the hotter months, but it only goes to prove how much turbocharged cars love cold dense air! Another VW brought in to us for mapping recenlty was this Scirocco R with the 2.0 Turbocharged EA113 engine (also used in VW Golf Mk5), which in standard trim is quoted at 261bhp and 258 lb ft torque. The car was already fitted with a full 3″ exhaust system, upgraded air inlet pipework and RamAir foam filter and a Loba 2.0TFSI uprated high pressure fuel pump. After mapping and rolling road set up the end results were a shade over 350bhp and 326 lb ft torque. The Lotus Europa is fitted with a Z20LER engine, as used in the Astra H 2.0 Turbo (Non VXR) and has the M32 6 speed gearbox. 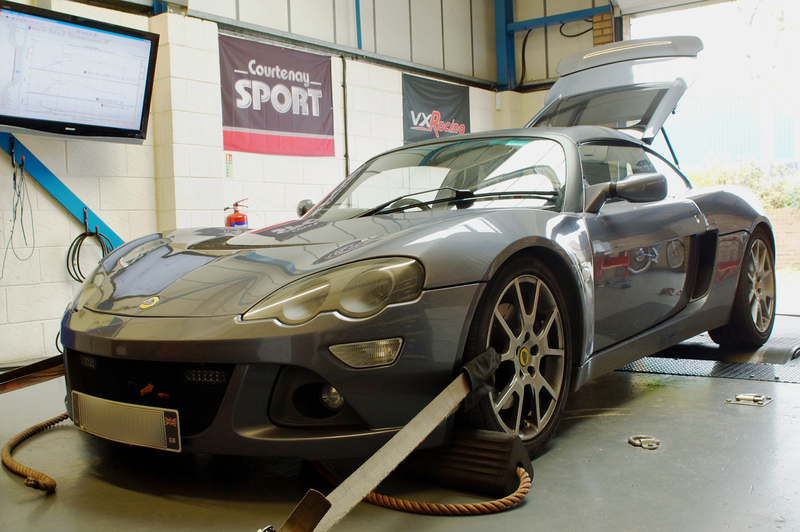 This particular car had been fitted with a VXR turbocharger, VXR injectors (both from the Z20LEH sister engine used in the Astra H VXR) and a Milltek exhaust and came in for ECU remapping and rolling road set up. To prevent clutch issues is also had an the uprated 240mm clutch and lightweight 240mm flywheel also used on Astra H VXR as an upgrade.